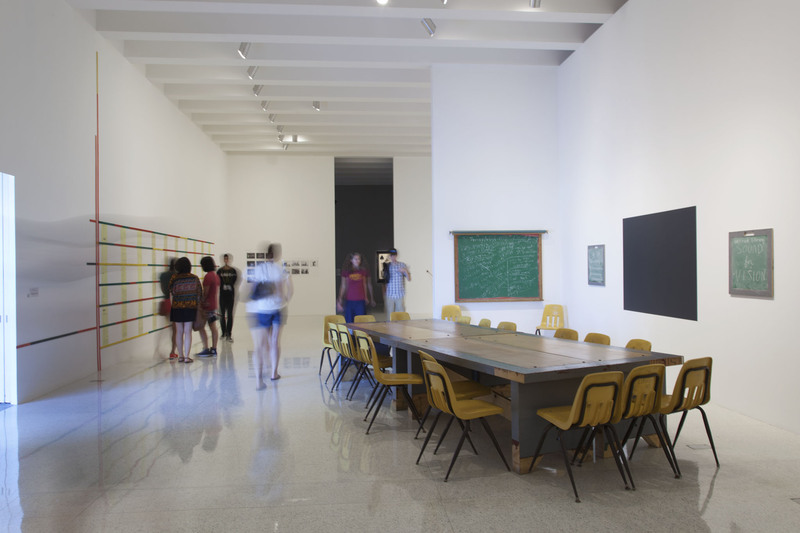 Theaster Gates’s installation See, Sit, Sup, Sip, Sing: Holding Court was included in Radical Presence: Black Performance in Contemporary Art, and was an important forum for the six months it was on view at the Walker Art Center. Artists—Ralph Lemon, Benjamin Patterson, Coco Fusco, and Gates himself—activated the piece with their stories and ideas. I had the pleasure of curating a concurrent series of community-generated conversations with partners who have produced works of art and created community-based institutions that serve the hearts, minds, and movements of people that have been here all along but were hidden in plain sight. Artist, writer, and community organizer Amoke Kubat has lived and worked in North Minneapolis for almost thirty years and wants you to know something about it—something good. In early October, the Walker hosted Tell Me Something Good and Northside Pop-Up Museum, a two-part program she curated and has toured around the city. Over three days, storytellers, musicians, filmmakers, activists, and visual artists brought a slice of the Northside to Lowry Hill, two Minneapolis neighborhoods that are geographically near but socioeconomically worlds apart. The Tumblr blog Judgmental Maps, founded by a Denver-based comedian, called the neighborhoods that make up the area the “Compton of the North” and “too scary to investigate” compared to Lowry Hill’s “art snobs” and “millionaire Democrats.” Although meant to be tongue-in-cheek send-ups of everyday thinking, these maps hit close to home. Named after the 1974 Rufus and Chaka Khan record of the same name, Tell Me Something Good is a storytelling program meant to challenge these predominant narratives about North Minneapolis and provide an alternative story to those posed by the evening news. “This project is important to me because I believe it is becoming a movement—the movement away from being isolated and redefined and red-zoned,” Kubat said. 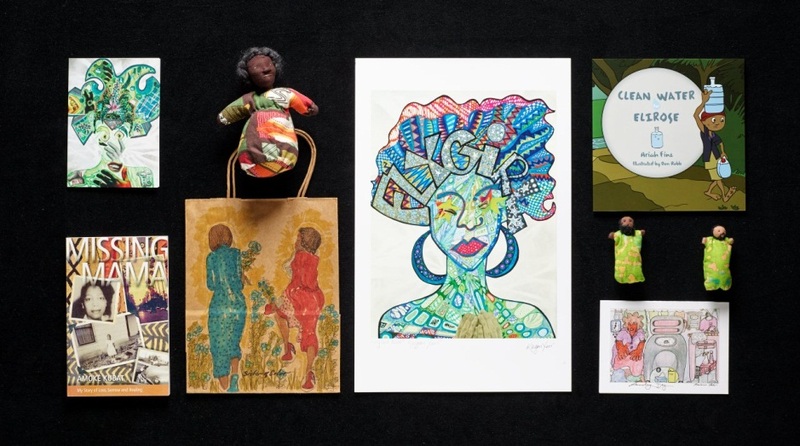 The Northside Pop-Up Museum challenges isolation with its flexibility as a portable gallery for the work of artists from North Minneapolis. A diverse set of Northside artists–including Keegan Xavi, Phira Rehm, E. Raelene Ash, Ariah Fine, and many others–showed collage, sculpture, drawings, photography, multimedia works, and literature, while others exhibited the material culture of everyday life, including an artist’s inclusion of her late father’s trusty guitar. Rather than activating Holding Court through embodied performance, the artwork and artifacts of the Pop-Up Museum used the platform to hold court, tell stories, and provoke questions from insiders and surprise passersby alike. Dressed in gown, sash, gloves, tiara, and heels, Andrea Jenkins performed as Miss Trans Life for the evening. Jenkins entered the room escorted by a young minder, a member of the Kulture Klub Collaborative, who carried a wooden picture frame around her face, recalling Lorraine O’Grady’s 1983 performance and photographic series Art Is… (1983/2009), featured in Radical Presence. Photographers and videographers, professionals and iPhone-wielding amateurs, sent the glare of flashbulbs across the room. Lorraine O’Grady’s iconic series of performances as art-party-crashing persona Mlle. Bourgeoise Noire called attention to racial exclusion in the 1980s art establishment and the mainstream feminist movement’s elision of race and class concerns. Like Mlle. Bourgeoise Noire, Miss Trans Life demanded our attention to her body and to the exclusion of trans people more generally, especially transgender women of color, from privileged cultural spaces, while also drawing attention to the violence they face in the wider world. 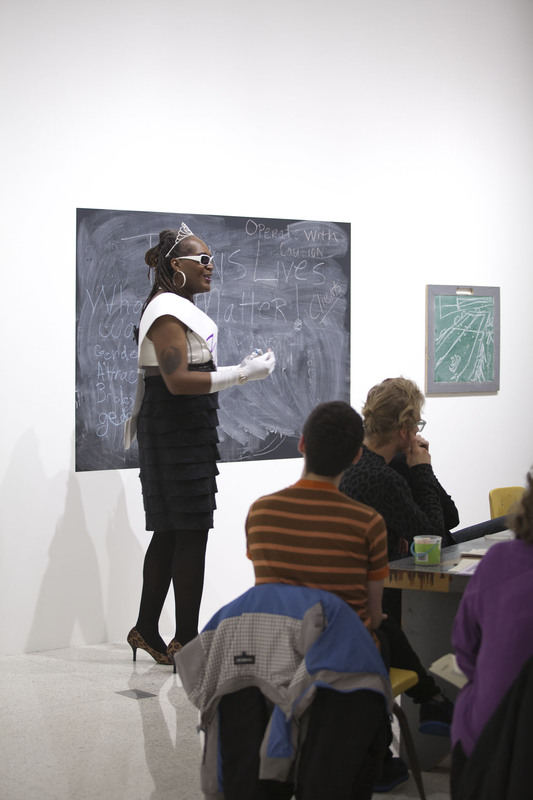 Deeply inspired by O’Grady’s career, Jenkins said she “attempted to incorporate some of the tropes that she employed by creating a spectacle and using the empty frame to highlight the notion that the body itself is a work of art.” To figure Miss Trans Life, a black transgender beauty queen, as a work of art was a powerful and poignant assertion. Transgender women bear the brunt of hate and biased violence against LGBTQ people. According to a 2014 report by the National Coalition of Anti-Violence Programs, 72 percent of LGBTQ homicide victims in 2013 were transgender women and 89 percent of those victims were people of color. It was a fitting celebration of life for an event held on International Transgender Day of Remembrance, the annual memorial for those who have been killed due to anti-transgender violence. Repetition was a key motif of the performance. Miss Trans Life read Andrea Jenkins’ poem eighteen three times—once, alone, atop Satch Hoyt’s installation Say It Loud and twice in unison with the audience of fifty. In joining the poet in the reading, audiences embodied the poem about trans bodies surrounded by traces of black bodies. The collaborative recitation of the poem over and over and over took on a trance-like quality with many voices commingling in the imperfect unison of a classroom’s daily Pledge of Allegiance. This time, however, it was a pledge to honor the lives of the dead by confronting present prejudice. eighteen is built on repetition—the repetition of the title, of the psychic stresses of survival, of the names of notable activists in the movement, of the institutions that regulate the lives of trans people, and of nascent progress. Between each reading, Miss Trans Life led her followers through the galleries as a queen might show off her collection to envious courtiers. The juxtaposition of the royal air of Miss Trans Life with Jenkins’ somber verses was stark. After a final reading in front of Daniel Tisdale’s aptly titled Transitions, Inc. (1992), Miss Trans Life led participants, now her fellow performers, to Holding Court for a conversation about passing, inter-sectionality, and, importantly, resistance. Jenkins uses her poetry to show that transwomen of color are not simply victims but are fighting back. Reina Gossett, Janet Mock, Laverne Cox, CeCe McDonald, and many others, all mentioned by name in eighteen are working to turn the tide through their activism, organizing, literature, and performance. On December 13, 2014 hundreds of artists and activists gathered in downtown Minneapolis under the banner “Million Artist Movement” to protest police killings of unarmed black men, including Michael Brown and Eric Garner. Joining dozens of other artists at the microphone in People’s Park, Jenkins rephrased the mantra of the current movement against racism and police brutality: #TransLivesMatter. Holding Court is made up of tables, chairs, and chalkboards salvaged from a public elementary school on the South Side of Chicago. The installation has since travelled from those humble origins to international art fairs and to museums around the United States. Much of the power of the work is the way that it plays with context, changing white-walled galleries into classrooms, chalk dust and all. Given the origin of the installation’s materials, it was only fitting to activate Holding Court with students and young people while it was on view at the Walker. 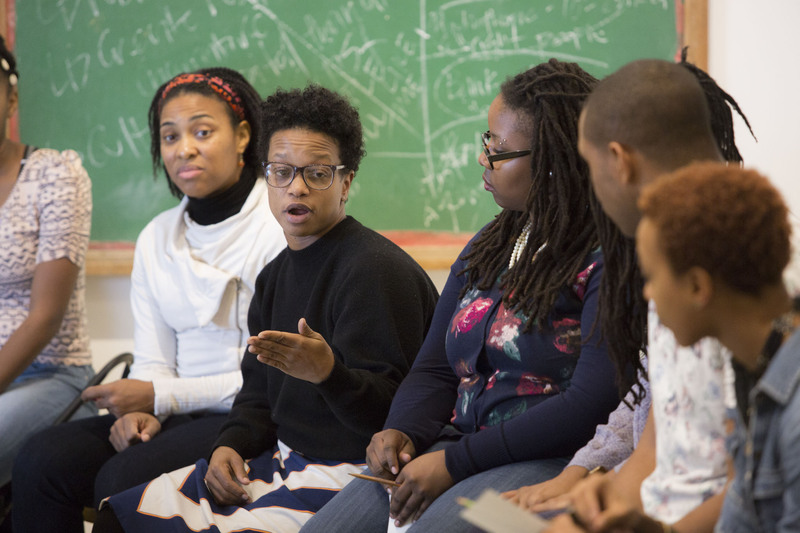 Students representing the University of Wisconsin-LaCrosse, the African American Registry, Penumbra Theatre Company, the Walker’s own Teen Arts Council, and others participated in a wide-ranging discussion that used works in Radical Presence as a springboard for talking about the here and now. In the spirit of the installation, students generated their own questions and posed them to each other. A key question interrogated the title of the exhibition Radical Presence: Black Performance in Contemporary Art. Why “radical”? Why “black”? 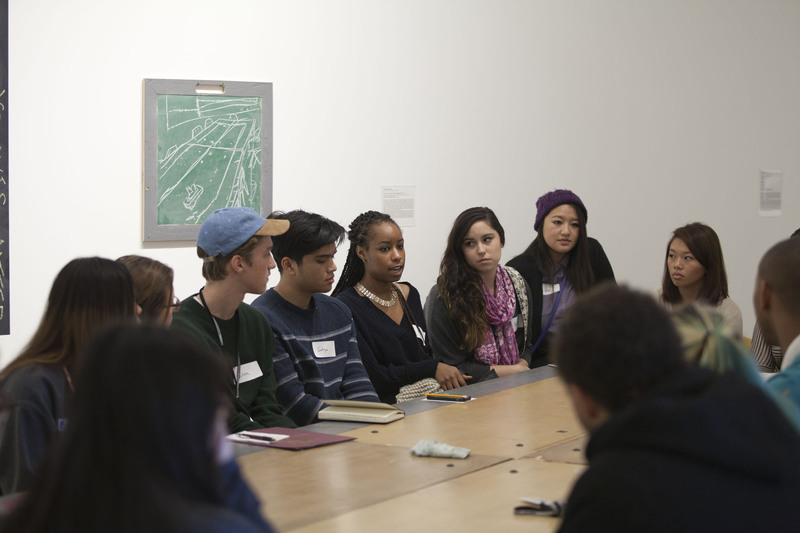 Participants ably debated the complexities of calling out race in the art world. One student argued in favor of naming race in the title of the exhibition as a crucial signal to audiences. If the everyday viewer assumes that the producer of contemporary art, especially the abstract or the conceptual, is white, isn’t it important to disrupt that assumption by marking that the work was indeed produced by black artists? Art historian Darby English’s book How to See a Work of Art in Total Darkness and recent statements by artist Adrian Piper present challenges to race-based curatorial projects and to “black art” as a category more generally. Perhaps without knowing it, these students recapitulated these important debates. This is hardly a surprise as these are pressing questions in public life, as we continue to grapple with the significance of the Obama presidency and debate the rise of what have been termed post-racial ideologies, which are increasingly called into question by the cries of #BlackLivesMatter—some by these very teens—emanating from the nation’s streets. Kenna-Camara Cottman, curator of November’s Choreographers’ Evening, answered Scott’s call with a resounding yes. The urgent program of dance that she assembled was followed up by a dynamic conversation with the Evening’s performers who held court to discuss contemporary dance making alongside the pressing contemporary questions of race, place, resources, and power in the Twin Cities. With its intended use as a forum for questioning institutions, Holding Court lends itself to self-reflexive conversations about location, space, and context. 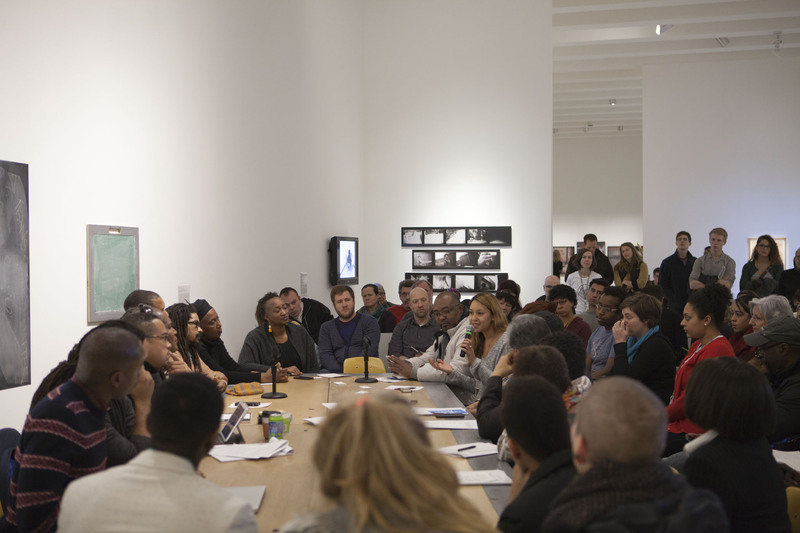 In this case, participants discussed the complexities of presenting their work in the Walker. 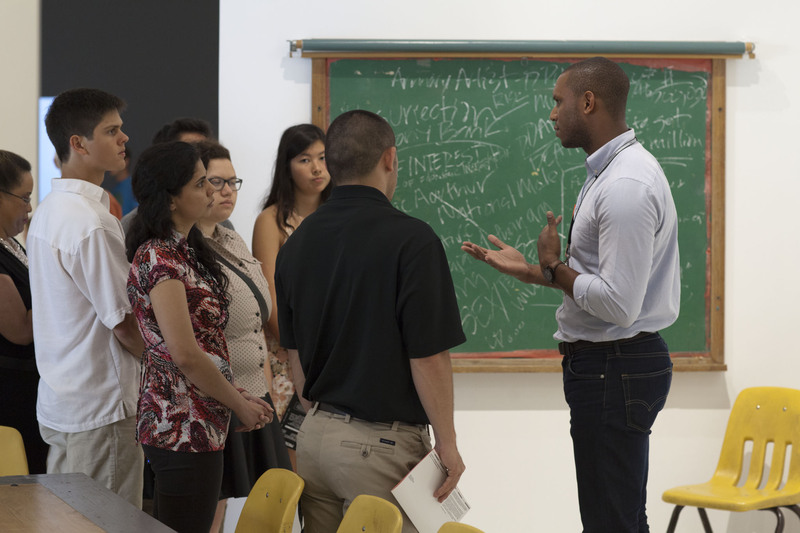 As an artist-centered institution, the Walker made its resources, staff expertise, facilities, and publicity available to carry out the vision of the curator and dance makers. In the context of this particular presentation, however, the dance makers noted some of the byproducts of that support—a largely white audience when nearly all performers were of color; ticket prices that were out of reach of some members of the desired audience; and the performance’s limited run. This conversation really points to some of the ongoing challenges of genuine inclusion and equity in the arts. As many of the dance works at Choreographers’ Evening made clear, long histories have produced our present quandaries. The limits of the broader dance community came to the fore as well. Many dancers and choreographers voiced their experiences of not feeling at home in the Twin Cities dance community. Some choreographers couldn’t tell the stories they wanted to tell without skilled black dancers, while others felt that they needed to leave the area for larger cities in order to have a fair shot at success. Still others are putting down roots here in the Twin Cities to build institutions that train and present the work of black choreographers and dancers to make this set of problems a thing of the past. Eric Garner died in Staten Island, New York, at the hands of a police officer who put him in a chokehold during an arrest. Garner, a father of six, had been accused of illegally selling loose cigarettes. On December 3rd, the officer, Daniel Pantaleo, was not indicted by a grand jury. The following day, Congressman Keith Ellison, an outspoken supporter of the recent Black Lives Matter protests, joined a standing room only crowd to activate Holding Court one final time at the Walker. Garner’s death was top of mind. Congressman Ellison immediately injected class and economic inequality into a conversation that had been largely structured around race. Garner’s hustle was a sign of economic precariousness that many families have always faced, now with the heightened effects of the recent recession. Pointing to the ways in which race and class have been historically linked in the United States—and are particularly visible in the death of Eric Garner—Ellison foregrounded the racial and class politics of the art which surrounded us. A key question was the efficacy of what might be called activist or political art to foment social change. The global art market’s profit motive circulates objects, at times despite their original context or potential meaning, as one of a number of valuable commodities. This circulation in galleries, museums, and auction houses creates conversation about the work but does this circulation subordinate other concerns to economic ones? In other words, a theme of discussion was whether a “radical” object on a collector’s wall makes a sound? Another important conversation was more a self-reflexive one: What did it mean for the Walker to host this conversation in its galleries and in the context of Radical Presence? Even as the exhibition and the programming held at Holding Court offered a way forward, it also raised ever more questions: What is the relationship between institutions, their desire to survive and grow, and the broader community? What are the challenges to building inclusive and equitable institutions? When and how do we start our own institutions and hold court where we already do?